Well Sunday was coming up so I had to do it big, you know how it goes. So we started planning our trip to Daytona Beach. It was forecast to be a great day with sunshine and warm water. So we loaded up Sunday morning and we did it big. We rolled out 8 cars deep, everyone of them being 240's, while we drove we had a inline 6 symphony blaring when we rolled down the highway. 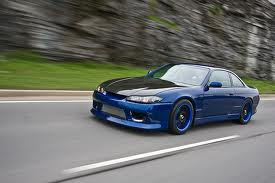 There is nothing like 1jz and rb25 in the morning,mmmmm inline 6 for the win. So as we drove to Daytona we made a couple pit stops to get our cars a little sideways of course. It was all in good fun and no one broke anything, thank God. It was around 9 o clock when we finally reached the beach, the sun was out and the weather was amazing, I couldn't have asked for a better day. I had a blast as the day grew on. We set up shop on the beach with umbrellas, chairs and our coolers....LIKE A BOSS! We were running that strip like nobody's business. You would have had to been there to understand the amount of WIN. Many people stopped by and asked about our cars while they were parked on the beach. Daytona is a really cool beach where you can drive up to the water. So we enjoyed sharing our information and our cars as well. Luckily the sand was nice and packed in so we didn't get stuck. We played frisbee and football in the sun. I got my tan on and couldn't have been happier. We shared the amazing drinks of awesomenesss out of that cooler like it was a gift from Heaven. Life was simple and we enjoyed every minute of it to say the least. There's nothing like gettin out and postin up at the beach like a goon and enjoying mother nature like that. So the day was coming to an end but our fun wasn't. We decided to meet up at the Wing House there and enjoy some of the best wings on Earth while we shared some pitchers of cold brew. None of the drivers drank of course. We caught the end of some football game that was on, so that was pretty cool. All in all Wing House rocked and so did those Garlic Parmesian Wings. We departed the eating establishment and headed towards home. 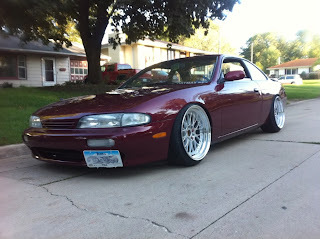 The 240 was hitting 35 psi of boost and we were ripping through the gears like Frankenstein on PCP. No children were taken hostage on this venture. We got home about 9 pm and we just passed out, it was a long day and a very fun day.